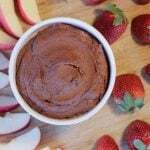 A deliciously creamy and chocolatey sweet treat that won’t affect your waistline. Serve with strawberries, pineapple or melon and surprise your guests. 1 tsp vanilla extract alcohol-free preferred. Or you could use almond extract. Place drained chickpeas in the bowl of a food processor. Add the cacao powder, maple syrup, salt, vanilla and 2 tablespoons of the non-dairy milk. Process for a few seconds and then scrape down the side with a spatula. Add a few more tablespoons of non-dairy milk until it reaches a consistency that’s good for dipping fruit. Serve in a shallow bowl that’s good for dipping.